Pic One of Earth's biggest icebergs ever seen has been discovered by orbiting satellites. The huge freeze-blob was just carved out from Greenland's Jakobshavn Glacier, and slid into the ocean. 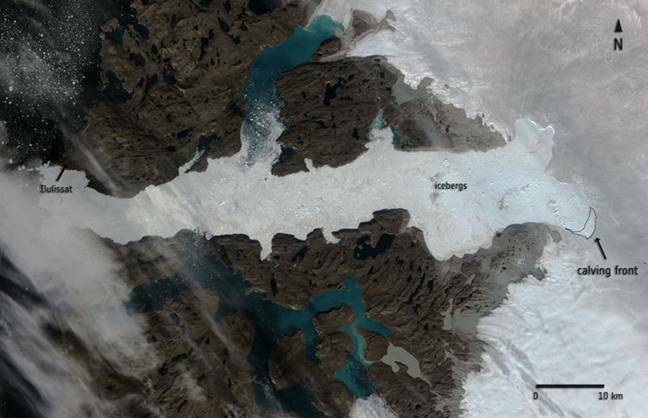 The iceberg was formed between August 14 and 16, and was caught on camera by one of the European Space Agency's Sentinel satellites, 2-A, which was launched in June. The satellite studies the entire Earth's surface once every ten days and will be joined by a twin to cut this time in half next year. The iceberg is an estimated 12.5 square kilometers across and has a depth of around 1400 meters, meaning a volume of 17.5 cubic kilometers. That would equate to enough ice to bury the entire island of Manhattan under 300 metres of frozen water. "Icebergs are often so large that they cannot float away easily," said ESA. "They remain, sometimes for years, stuck on the bottom in shallower areas of the fjord until they finally melt enough to disperse, break into pieces or are pushed out by icebergs coming up from behind." The Jakobshavn glacier that birthed the 'berg is of particular interest to scientists, since it has become one of the fastest moving ice sheets on Greenland and appears to be speeding up. Since it largely consists of ice on land, any ice that floats off will contribute to sea level rises, unlike floating Arctic ice which lowers sea levels when it melts.